I am not sure we can even put into words what an incredibly memorable and special weekend was had in the mountains of Sun Valley, Idaho for our rustic luxe mountain wedding. When it comes to planning a wedding there are so many details that it is hard to pick a starting point. Luckily we had 18 months from the time we got engaged in Santa Cruz, California to plan our special day. After the initial excitement and awe of knowing we wanted to spend the rest of our lives together it was time for us to get busy. The first decisions for us were picking a location and a date for our wedding. We looked for local venues in Idaho and since we love to travel, we thought we look for a few venues in Scottsdale, Arizona, one of our favorite places to go for a weekend getaway. Since we both had family that would be traveling in for the big day, we were open to the idea of a destination wedding. Right after we met, we spent our first Valentine's day in Sun Valley, Idaho. We fell in love with Sun Valley and Ketchum and with it being so close, we continued to visit this beautiful resort town in the middle of Idaho's mountains frequently. In April of 2015 we spent a long weekend in Sun Valley relaxing, hiking and looking at wedding venues. 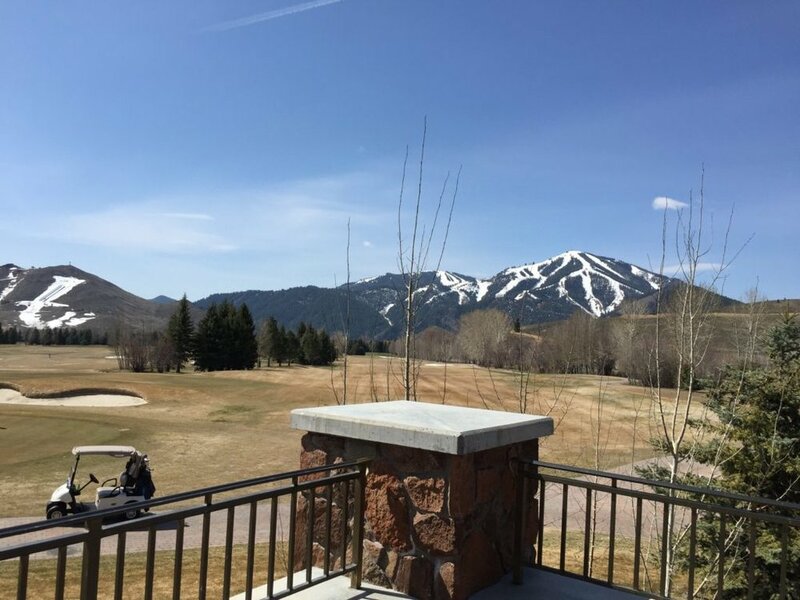 We looked at the Sun Valley Club as a possible venue and we really liked it (we also were super impressed by Sun Valley Company's wedding coordinator-Megan) but we didn't want to jump to a decision before we looked at a few possible destination wedding options. We took our first trip to Scottsdale together over labor day weekend of 2014 on a whim and we absolutely fell in love! Everyone thinks we are crazy for vacationing in Scottsdale during their extremely hot summers, but it is such a beautiful place with so many fun things to do, amazing shopping, excellent food and a great nightlife. As the search continued, we took another trip to Scottsdale in May of 2015 for fun and to look at the Four Seasons at Troon North as a possible wedding venue. This particular property is located about 30 minutes from downtown Scottsdale with not much around it, making it harder for us to have the weekend we wanted everyone to have. In September of 2015, we returned to Scottsdale for a relaxing Labor Day weekend and to consider Hotel Valley Ho for our wedding. Located within walking distance from Old Town and Downtown Scottsdale, we thought this venue could be an excellent choice for our special day. Unfortunately the venue we would use for the ceremony and reception appeared to be a little dated and didn't quite fit the theme that we had in mind. After returning from Scottsdale without having a venue selected we decided to return to Sun Valley to take one more look at all possible venues. One of the reasons we returned to Sun Valley besides loving the natural beauty and landscape of the area was because of a person we met while looking for a venue. 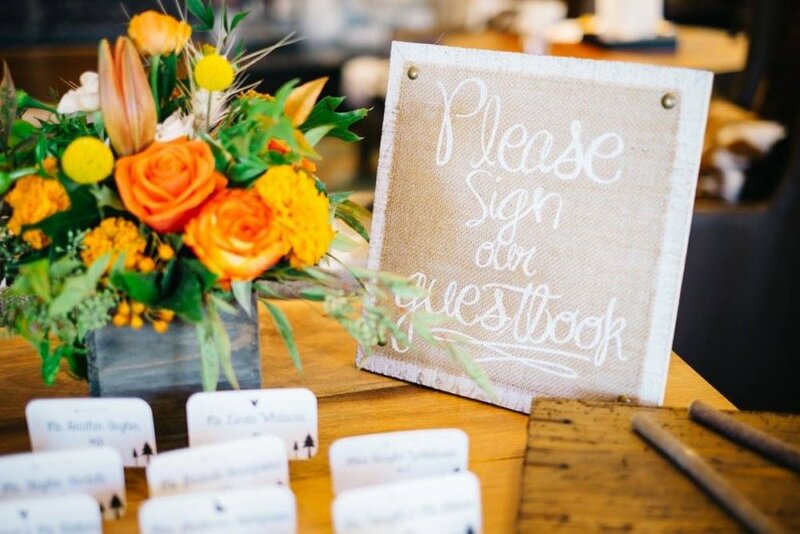 Megan Gergen, the Wedding Coordinator at Sun Valley Company, spent time showing us several venues, walking us through exactly where key events would take place on our big day and most importantly making us feel comfortable. She showed us River Run Lodge, and we absolutely fell in love with it's rustic and elegant charm. She left us with a feeling that none of the other properties wedding coordinators did and just made us feel comfortable with our decision. Needless to say it was that very weekend in September of 2015 when we decided where we would stand a year later and tie the knot! With the needle in a haystack hunt over for the perfect venue and the date of September 24th, 2016 selected, it was time to begin planning! Over the next few weeks we spent time on the weekends drinking coffee and asking each other what we wanted our wedding to look like. There are so many small details from the colors, to the food, to the decor, to what flavor of cake, to wedding favors, to flowers and everything in between. Both of us are very detail oriented people so we just wanted to make sure we didn't miss anything. After planning a wedding and relying a lot on the internet and Pinterest for ideas for the wedding, we aren't quite sure how people even began to plan a wedding 10 years ago without the technology that we have today! There are so many ideas for weddings on Pinterest and the internet that the sky is the limit. 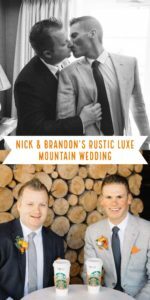 After browsing ideas, we decided the theme for our wedding to be a rustic luxe mountain wedding. 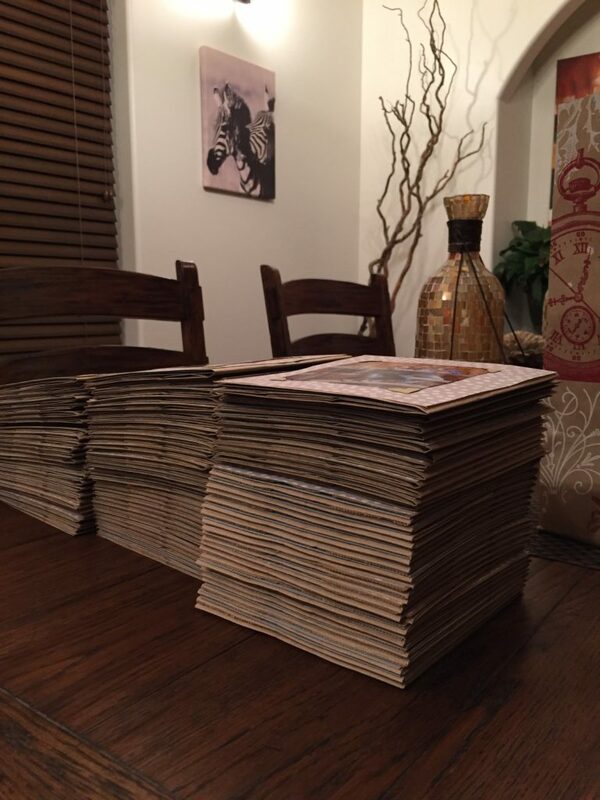 And for the next 12 months we kept busy planning the wedding and even hand-making our save the dates, wedding invitations and some of the decor. Fast forward to September 21st, 2016. After jam packing all of our decor, clothes, suits, etc. into the car we began the drive to Sun Valley, Idaho where in just a few short days we would express our love for each other publicly in front of all of our friends and family. The next few days were spent hiking, relaxing, drinking coffee in the hot tub in the rain, making sure everything was in place for the big day, and enjoying time with each other. As friends and family began to arrive, the excitement and suspense began to build. Finally we would get to see all of the details of our planning come together! On Friday September 23rd we had a welcome reception at the bowling alley in the basement of the iconic Sun Valley Lodge. That night we enjoyed pizza, sweet treats and cocktails surrounded by our friends and family (Nick just happened to win our final game of bowling before we were married). Going to bed that night was difficult knowing the next day we would tie the knot and become husband and husband. Welcome to one of the best day's of our lives! Waking up on September 24th, 2016 knowing this was the day we had been waiting for was such a great feeling. It was a day that was all about us and a celebration of our love for one another. People say how stressful weddings can be but we made a promise to each other that we were going to focus on ourselves and not let anything ruin our special day. Before meeting our immediate family for breakfast on the big day, we went for a hike on what was a very crisp and cool fall morning. The mountain air was so cool but we stopped a few times to hold each other and warm up. There we stood on the side of the mountain surrounded by peaceful nature and the trickle of a nearby stream. We both knew today would be a day like no other day that we had ever experienced before. After breakfast the rest of the day was spent relaxing, getting ready and taking pictures before the ceremony. For our pictures we had identified a few places ahead of time we knew we wanted to get pictures at before heading to River Run Lodge where all of the evenings festivities would take place. The afternoon was spent going to a those locations and capturing the moments of our special day. As most of you reading this probably already know we are both coffee addicts. 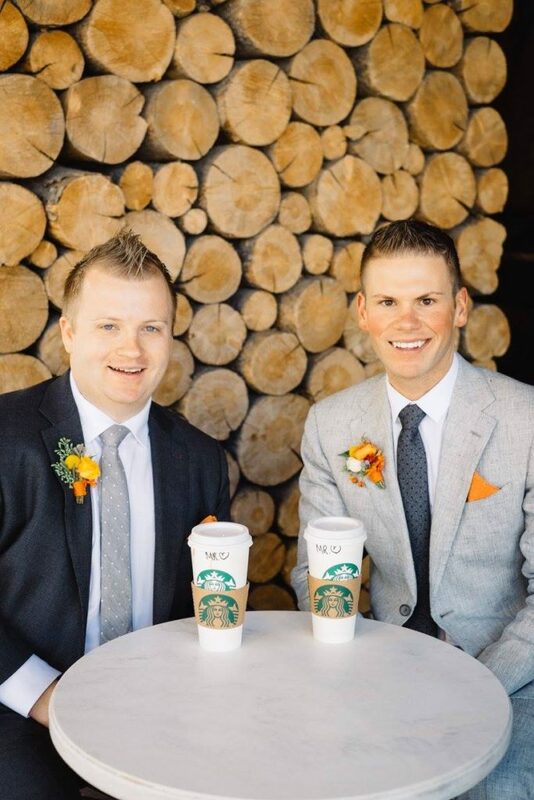 So what do two coffee lovers do right before they are about to say "I Do", well go on a coffee date to Starbucks of course! In fact we were having so much fun on our wedding day spending time together and posing for pictures that we forgot to each lunch. So the coffee date was a great way to take a breather and have one more moment to ourselves before our ceremony. In the moment our song came on to walk down the aisle, the butterflies set in, and the look in our eyes was like we were both falling in love with each other all over again. Our wedding coordinator Megan gave us a big push from the bush we were hiding behind and it was then we knew our wedding day was everything we had hoped it would be. Our rustic luxe mountain wedding ceremony at the base of Bald Mountain on September 24th, 2016 was the most picturesque day ever. The weather was absolutely perfect, there wasn't a cloud in the sky, the sun was shining and temperatures were in the 70's. The beautiful flowers by Blush Floral only added to the fall Idaho colors. Surrounded by friends and family we exchanged the vows we wrote. 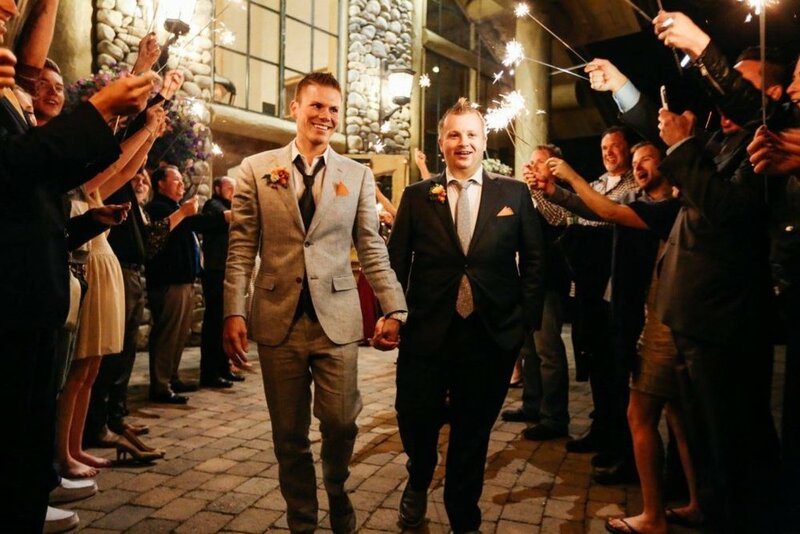 Our ceremony wasn't your typical wedding with parties and a large religious influence but more of a focus on us and that love is love. We exchanged vows, shed many tears, shared many laughs and shared our first moments together as Mr. & Mr. Words can't express our thankfulness and gratitude for everyone who made the trip to Idaho to be with us on our wedding day. The day wouldn't have been the same without you there. Our vision of a rustic luxe mountain wedding all came together from the outdoor ceremony at the base of Bald Mountain to the reception in the lodge. The decor, cake, flowers, colors and textures all came together to create a very elegant celebration. We ate, we drank, we danced and we shared in the night with our guests. Everything from the people, the food, the music (we had an incredible DJ - Nathan Hudson Entertainment) and the celebration all combined to make such an incredible evening for us. 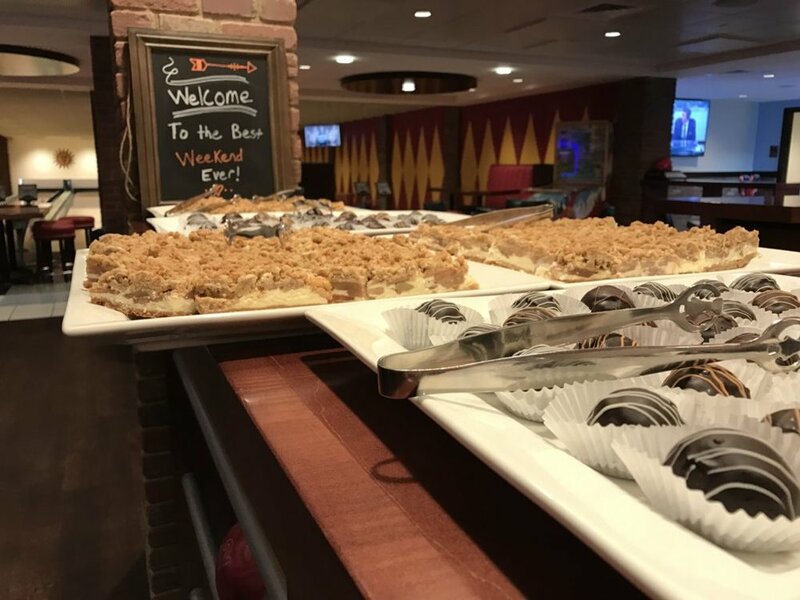 Wanting to make sure our guests indulged a little, we made sure there were plenty of sweet treats! In addition to the candy bar which was stocked with Arno Chocolate, there were three flavors of cupcakes and an ice cream station with our own special flavor of ice cream from Clover Leaf Creamery! We hope you wore your dancing shoes! Imagine a big dance party with your favorite people and your favorite songs. We danced and we danced and we danced some more. The party just kept going and just when we thought the celebration would die down, it just kept going. We have to admit we aren't big dancers as we tend to be on the shy side, but we had so much fun dancing that night! As the evening began to wind down around midnight, it was time for us to make our exit. We knew we wanted to do a sparkler exit but we weren't sure how it would turn out. We were worried that it might be dangerous for people to hold sparklers after a night of partying, but luckily no one was injured from playing with fire! And the sparkler exit made for beautiful pictures! The next morning we were reunited by our closest friends and family for a brunch at perhaps one of the best kept secrets in Ketchum, a little French restaurant, Cristina's. It was there we relived the night before with stories and laughter while everyone indulged in a delicious spread of bacon, eggs, pancakes, fresh toast, potatoes and pastries! The next moments were bitter sweet as we said good-bye to the friends and family who traveled near and far to be with us. We hope you enjoyed experiencing our rustic luxe mountain wedding from our point-of-view! If you haven't already be sure to follow us on Instagram and like our page on Facebook.